A great collection that will go with anything! 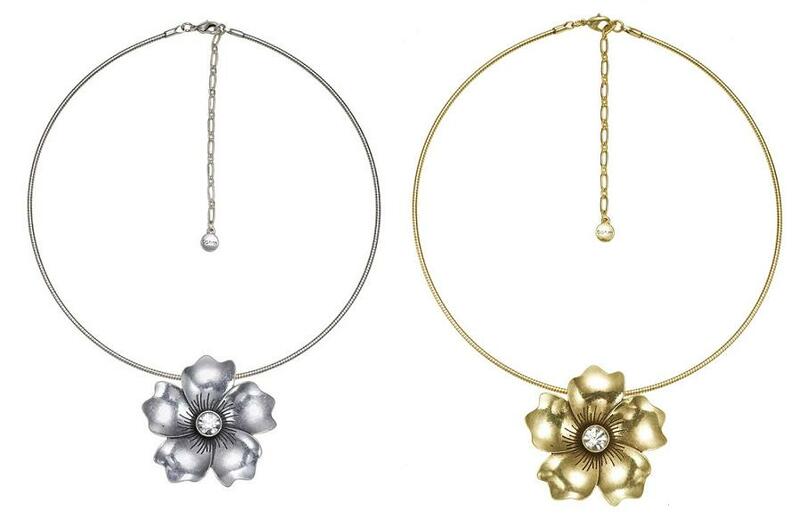 Plain metal flowers combined with Swarovski crystals form a wide selection of accessories. Available in gold or silver plates! 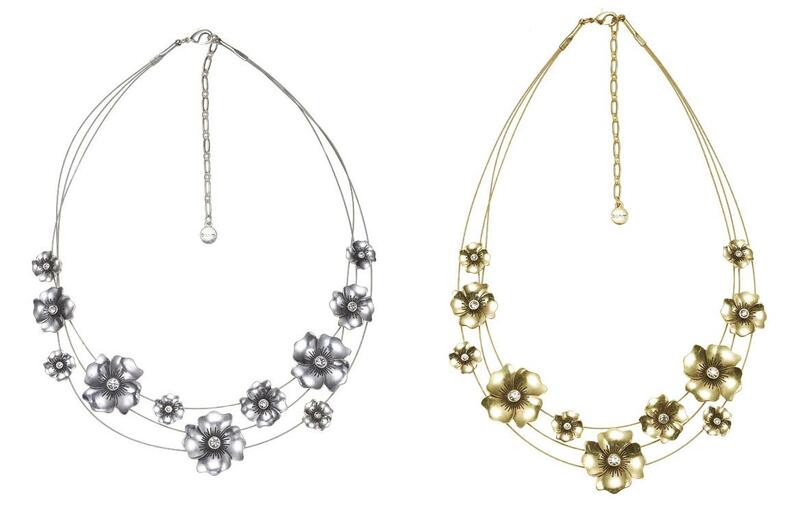 Beautiful collar necklace, with plain metal flowers with Swarovski crystals. The various motifs measure 1.5cm/15mm up to 3cm/30mm. 16 inches/40.5cm to an adjustable 19 inches/48.5cm. Choose from gold or silver plate. 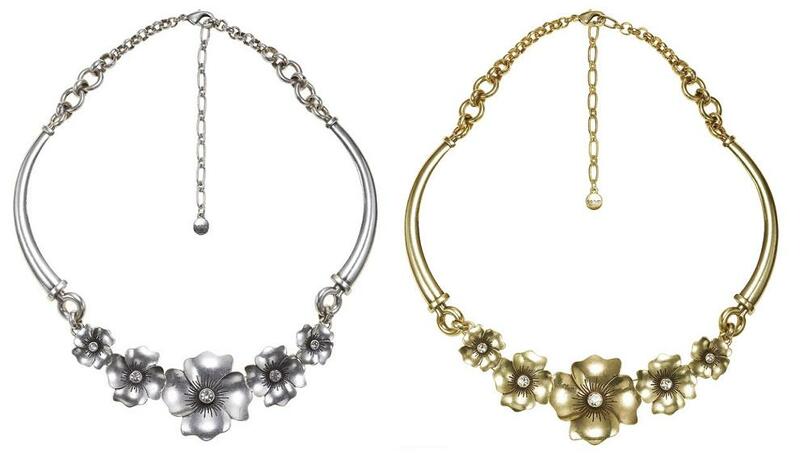 Beautiful collar necklace, with plain metal flower pendant with Swarovski crystal. The flower measures 5cm/50mm. 16 inches/40.5cm to an adjustable 19 inches/48.5cm. Choose from gold or silver plate. Beautiful double stranded necklace, with plain metal flower pendant with Swarovski crystal. The flower measures 3.5cm/35mm. 15 inches/40.5cm to an adjustable 18 inches/48.5cm. Choose from gold or silver plate. Beautiful flower and bead leather cord bracelet. It is adjustable. 5 inches/12.5cm up to 9 inches/22cm. The flower measures 2.5cm/25mm. Black/silver plate or brown/gold plate. 2 x pairs of stud type earrings. One pair is a plain clear crystal stud (measures 8mm) with bullet backing. The second pair are beautiful flowers set with clear Swarovski crystals (1.2cm/12mm) stud style with bullet backs. Beautiful flower earrings with a french clip style backing for pierced ears. The flowers are set with clear Swarovski crystals. The flower measures 1.5cm/15mm total length from top of hook 2.5cm/25mm.